Samsung seem to be on a dual-SIM launch spree. 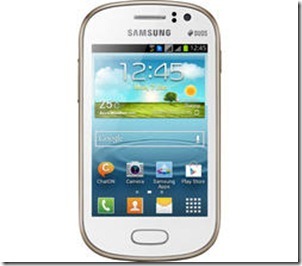 The latest entry in this category is the Galaxy Fame Duos S6812, which features a 1GHz processor with dual-SIM support. This means that Samsung have a dual-SIM device in each category – entry level (Fame Duos), mid-range (Win Duos) and high-end (Grand Duos), which gives the people a wide array of choices to choose from, depending on their budget and the kind of performance they expect from their phone. The phone is priced at 10,990 INR online, at the moment. 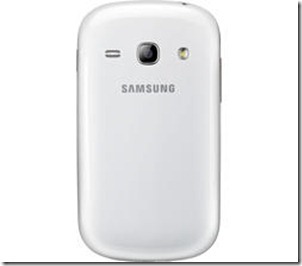 The Galaxy Fame supports dual-SIM with dual standby, just like the other Galaxy duos devices, which means you can use both SIMs at the same time. The device will come bundled with Android 4.1.2 Jelly Bean, which means users won’t have to update from ICS to Jelly Bean themselves. The dual-SIM smartphone features a 3.5 inch TFT touchscreen which has an HVGA resolution of 320×480, which we think is pretty outdated by now, and Samsung could have offered a little bigger screen with better resolution at that price point keeping in mind the innumerable competitors. There is 4GB on board storage which is not great, but not very bad either. You can use microSD cards of up to 64GB in order to increase the available memory. There is 512MB RAM, which will not be enough of you are a heavy multitasker but should be ok if you use your phone casually for a little web browsing and a few calls/SMS. A front facing VGA camera will aid in video calling, while a 5 megapixel unit at the rear will be useful to click photos once a while. Standard connectivity features such as GPRS, WiFi, GPS, Bluetooth, micro USB, 3.5mm audio jack with the inclusion of 3G are available. 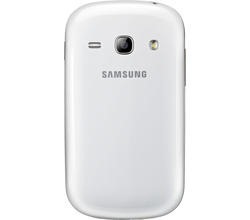 We’re disappointed with the battery – Samsung has chosen to include a paltry 1300mAh battery with the phone. Since it is a dual-SIM device, the battery usage will be heavy and 1300mAh might prove short of your expectations. The battery is said to give a backup of 6hrs on talktime and over 280hrs of standby. We think Samsung could have priced the device better, keeping in mind the competition and what all they are offering in the 11,000 INR range, the Fame Duos is not as feature packed as other devices in that range. Although the inclusion of Android 4.1.2 should be a plus point for the phone, but it won’t be able to make up for the shortcomings in terms of battery and small screen. We think a price tag of around 8-9,000 INR would have made the device much more attractive. 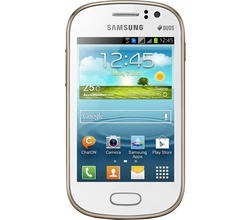 The phone is available in White and Blue, and can be bought online for 10,900 INR on Infibeam. Its too good to use and its very easy to use.